NINLARO® (ixazomib) is indicated in combination with lenalidomide and dexamethasone for the treatment of patients with multiple myeloma who have received at least one prior therapy. 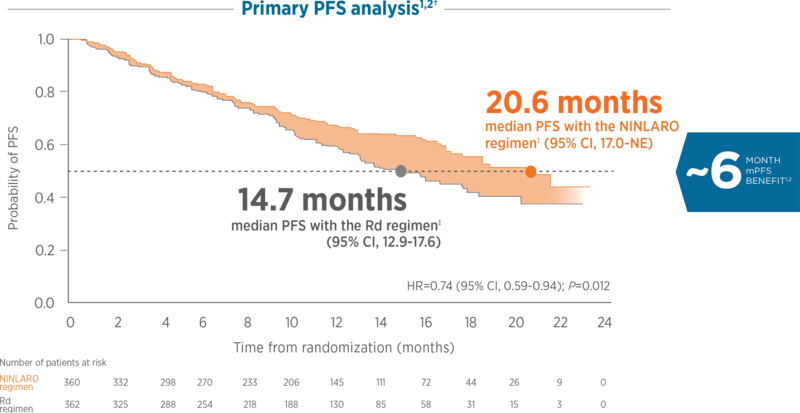 †At a median follow-up of 23 months, a planned interim OS analysis and noninferential PFS analysis were conducted. No OS advantage was observed; data were immature and the study remains ongoing. 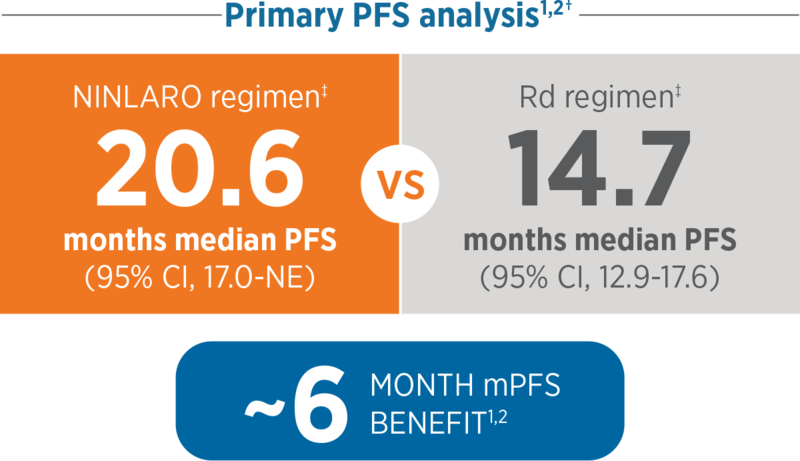 The PFS analysis supported a clinical benefit of the NINLARO regimen (median PFS: 20 months vs 15.9 months; HR=0.82 [95% CI, 0.67-1.0]). *The NINLARO regimen included NINLARO+lenalidomide+dexamethasone. The placebo regimen included placebo+lenalidomide+dexamethasone. NE=not evaluable; OS=overall survival; PFS=progression-free survival. Multiple myeloma is a disease you can't cure, so I think it's important to keep patients on treatment until progression or unacceptable toxicity." *Defined as treatment to progression or unacceptable toxicity. †Stratification: 1 vs 2 or 3 prior therapies; PI exposed vs PI naïve; and ISS stage I or II vs III. ‡Defined as patients with del(17), t(4;14), and/or t(14;16). ECOG=Eastern Cooperative Oncology Group; IMWG=International Myeloma Working Group; IRC=independent review committee; ISS=International Staging System; MM=multiple myeloma; PI=proteasome inhibitor. of patients were previously treated with bortezomib. When we look at the baseline characteristics as a whole, it's representative of the broad patient population we see in the relapsed setting." 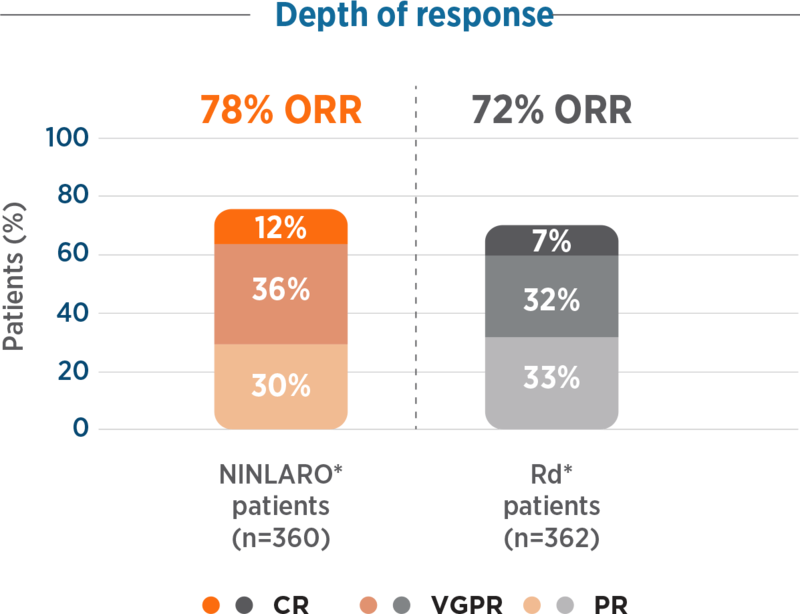 CR=complete response; ORR=overall response rate; PR=partial response; VGPR=very good partial response. of patients achieved ≥VGPR WITH the NINLARO regimen. *Defined as patients with del(17), t(4;14), and/or t(14;16). Thrombocytopenia has been reported with NINLARO® (ixazomib). During treatment, monitor platelet counts at least monthly, and consider more frequent monitoring during the first three cycles. Manage thrombocytopenia with dose modifications and platelet transfusions as per standard medical guidelines. Adjust dosing as needed. Platelet nadirs occurred between Days 14-21 of each 28-day cycle and typically recovered to baseline by the start of the next cycle. Gastrointestinal Toxicities, including diarrhea, constipation, nausea and vomiting, were reported with NINLARO and may occasionally require the use of antidiarrheal and antiemetic medications, and supportive care. 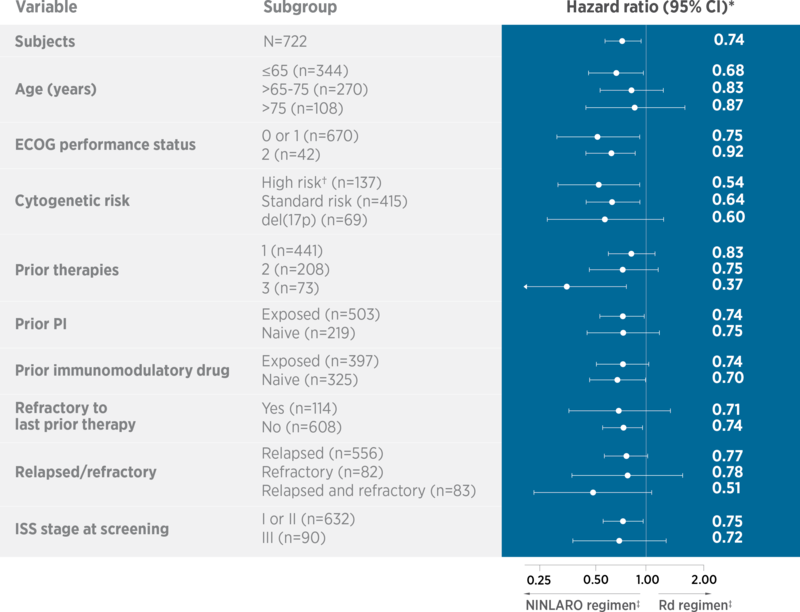 Diarrhea resulted in the discontinuation of one or more of the three drugs in 1% of patients in the NINLARO regimen and < 1% of patients in the placebo regimen. Adjust dosing for severe symptoms. Embryo-fetal Toxicity: NINLARO can cause fetal harm. Women should be advised of the potential risk to a fetus, to avoid becoming pregnant, and to use contraception during treatment and for an additional 90 days after the final dose of NINLARO. Women using hormonal contraceptives should also use a barrier method of contraception. Renal Impairment: Reduce the NINLARO starting dose to 3 mg in patients with severe renal impairment or end-stage renal disease requiring dialysis. NINLARO is not dialyzable. Lactation: Advise nursing women not to breastfeed during treatment with NINLARO and for 90 days after the last dose. Please see NINLARO (ixazomib) full Prescribing Information. 1. Moreau P, Masszi T, Grzasko N, et al; for TOURMALINE-MM1 Study Group. Oral ixazomib, lenalidomide, and dexamethasone for multiple myeloma. N Engl J Med. 2016;374(17):1621-1634. 2. Raedler LA. Ninlaro (ixazomib): first oral proteasome inhibitor approved for the treatment of patients with relapsed or refractory multiple myeloma. Am Health Drug Benefits. 2016;9(spec feature):102-105. 3. Data on File 120, Takeda Pharmaceuticals International Co. 4. Data on File 121, Takeda Pharmaceuticals International Co. 5. Richardson PG, Avet-Loiseau H, Palumbo A, et al. Efficacy and safety of ixazomib plus lenalidomide-dexamethasone (IRd) vs placebo-Rd in patients with relapsed/refractory multiple myeloma by cytogenetic risk status in the global phase 3 TOURMALINE-MM1 study. Poster presented at: American Society of Clinical Oncology (ASCO) Annual Meeting; June 3-7, 2016; Chicago, IL. 6. Data on File 117, Takeda Pharmaceuticals International Co. 7. Data on File 113, Takeda Pharmaceuticals International Co. 8. Data on File 109, Takeda Pharmaceuticals International Co. 9. Data on File 114, Takeda Pharmaceuticals International Co. 10. Data on File 115, Takeda Pharmaceuticals International Co. 11. Palumbo A, Niesvizky R. Sustained disease control in transplant-ineligible patients: the role of continuous therapy. Leuk Res. 2012;36(suppl 1):S19-S26. 12. Girnius S, Munshi NC. Challenges in multiple myeloma diagnosis and treatment. Leuk Suppl. 2013;2(suppl):S3-S9. 13. Mateos M-V, San Miguel JF. How should we treat newly diagnosed multiple myeloma patients? Hematology Am Soc Hematol Educ Program. 2013;2013:488-495. 14. Palumbo A, Gay F, Cavallo F, et al. Continuous therapy versus fixed duration of therapy in patients with newly diagnosed multiple myeloma. J Clin Oncol. 2015;33(30):3459-3466. 15. Is multiple myeloma curable? Multiple Myeloma Research Foundation. https://www.themmrf.org/multiple-myeloma/multiple-myeloma-treatment-options/myeloma-cure. Accessed August 21, 2017. 16. Durie BGM. Concise review of the disease and treatment options. International Myeloma Foundation. 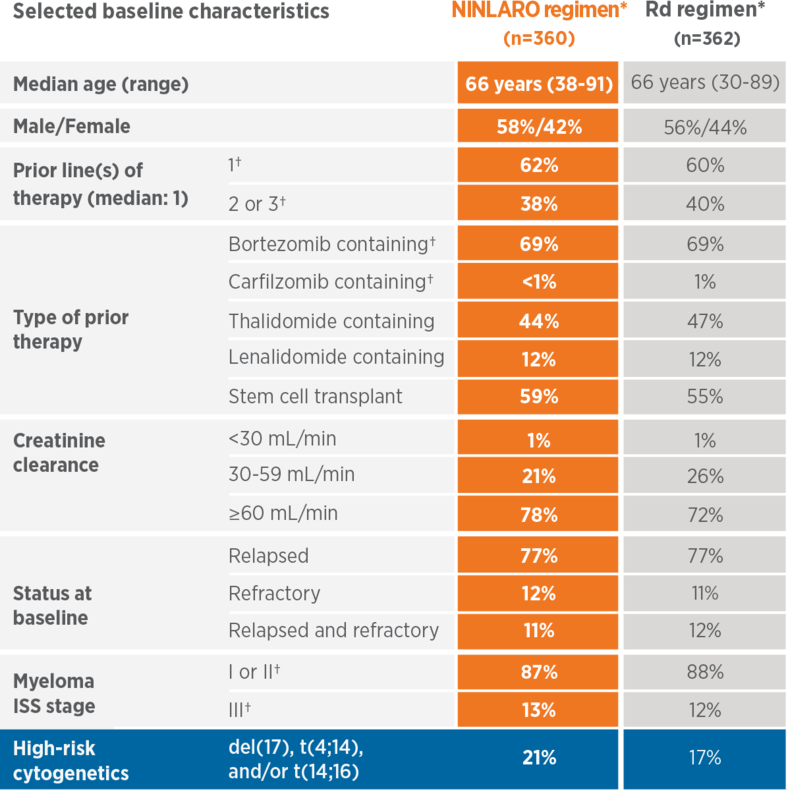 https://www.myeloma.org/sites/default/files/images/publications/UnderstandingPDF/concisereview.pdf. Published 2011. Accessed August 21, 2017. 17. Kurtin SE. Relapsed or relapsed/refractory multiple myeloma. J Adv Pract Oncol. 2013;3(suppl 1):5-14. 18. Multiple myeloma: treatment overview. Multiple Myeloma Research Foundation. 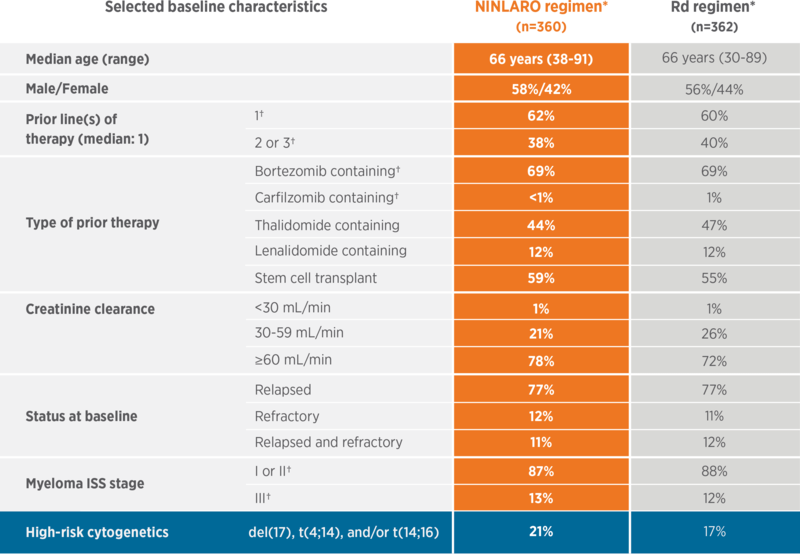 https://www.themmrf.org/wp-content/uploads/MMRF_Treatment_Overview.pdf. Accessed August 21, 2017. 19. Zolnierek KB, DiMatteo MR. Physician communication and patient adherence to treatment: a meta-analysis. Med Care. 2009;47(8):826-834. 20. Westbury J. Why do older people not always take their medicines? Pharmaceutical J. 2003;271:503-504. 21. Yong K, Delforge M, Driessen C, et al. 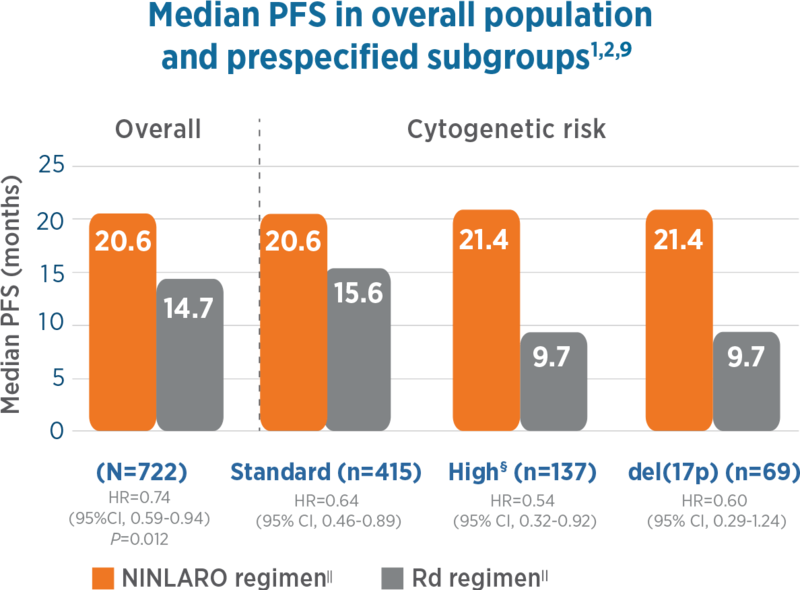 Multiple myeloma: patient outcomes in real-world practice. Br J Haematol. 2016;175(2):252-264. 22. Jagannath S, Roy A, Kish J, et al. 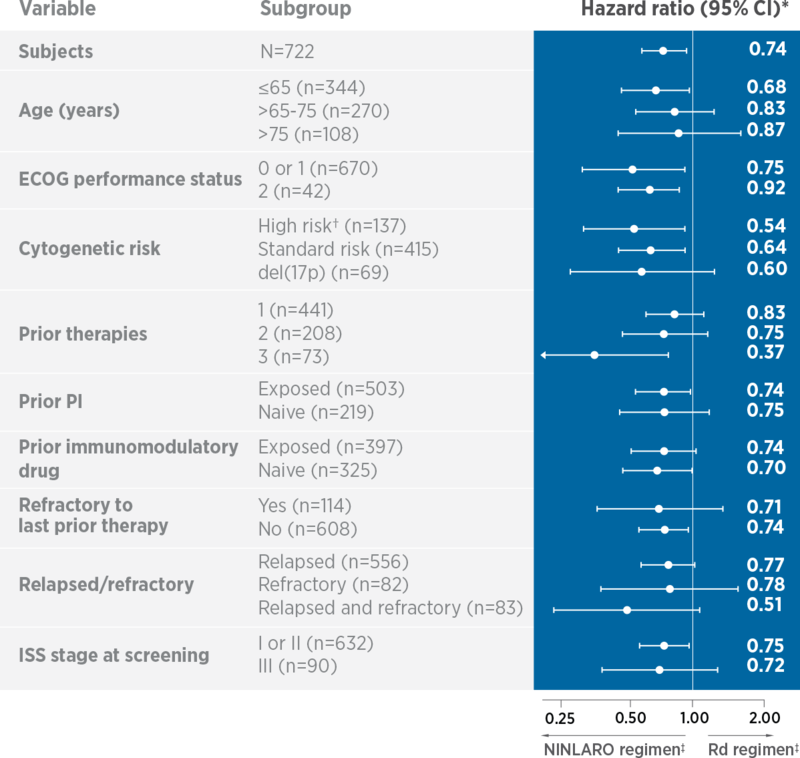 Real-world treatment patterns and associated progression-free survival in relapsed/refractory multiple myeloma among US community oncology practices. Expert Rev Hematol. 2016;9(7):707-717. 23. Romanus D, Raju A, Yong C, et al. Duration of therapy in U.S. patients treated for relapsed/refractory multiple myeloma (RRMM) in the real world. Poster presented at: European Hematology Association 21st Congress; June 9-12, 2016; Copenhagen, Denmark.